All components of our size reduction systems are also available as individual elements for the modification of your existing lines to replace broken elements, to increase throughput, to improve the automatic operation and to increase efficiency. They take the load of a big bag, e.g. 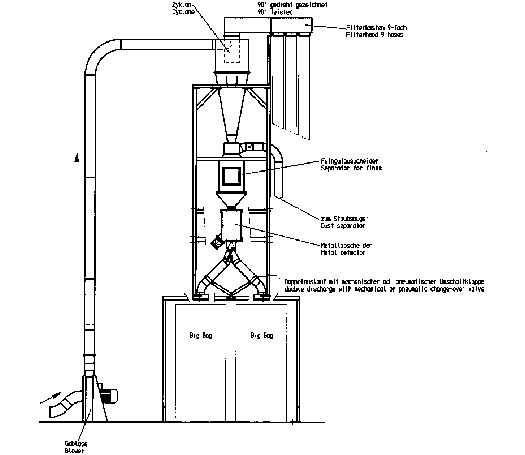 in front of a pulverizer, and automatically transport it into a buffer or silo. 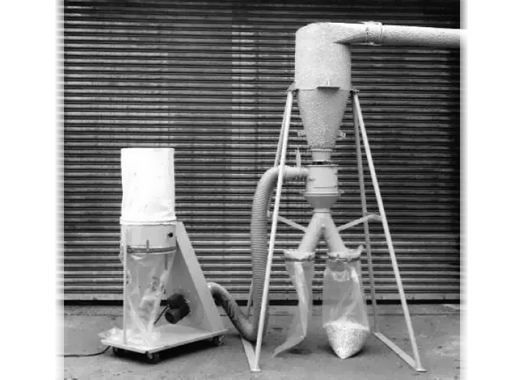 They allow for a semi-automatic operation of a pulverizer line or semi-automatic discharge of the feedstock from big bags into a silo in front of the pulverizer line. Widths from 200 to 2000 mm (8 to 78 inches), lengths from 1000 to 25000 mm (39 to 975 inches). Models for light, medium and heavy loads. 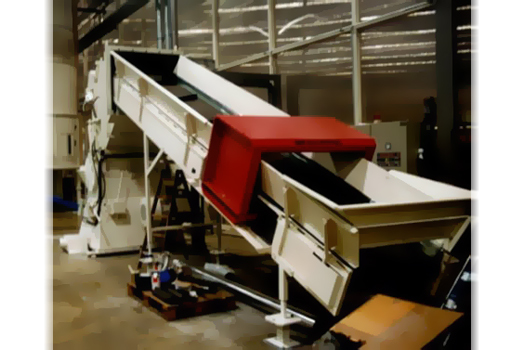 As feeders for pulverizers and discharge conveyors for hammermills; widths from 200 to 1500 mm (8 to 58 inches), lengths from 300 to 6000 mm (12 to 230 inches). To measure the throughput of your size reduction line, to transfer the measured data into your process control system. Built into belt conveyors to protect the succeeding granulator from metallic parts. The detection coil will automatically stop the conveyor as soon as metal enters its detection zone. Blowers, pipes, cyclones and all ancillaries for pneumatic conveying systems: Our blowers are available from 1.5 kW to 30 kW (2 HP to 40 HP); we use pipe diameters of 60 mm to 300 mm (2.5 to 12 inches); for each blower the matching cyclone separator is available. Our own manufacturing of essential components keeps costs down for reasonable pricing. To protect the succeeding injection molding or extrusion systems that use the regrind material. Metal particles will automatically get separated. For semi-automatic packaging operations we provide double big bag filling stations to ensure a continuous grinding process that will not be interrupted by big bag changes. 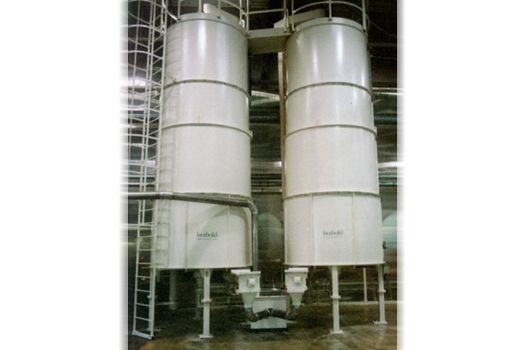 We provide simple cylindrical silos, slightly conical silos with rotating bottoms to support the material discharge as well as rectangular silos with agitation and discharge screws for difficult materials with unfavourable flow characteristics. To control throughputs, down-times, faults and maintenance intervals.